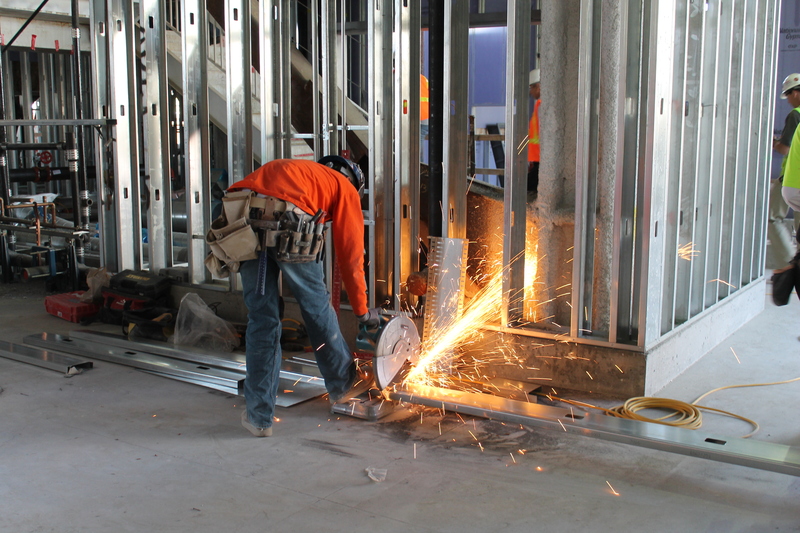 With framing going up fast and furious inside and outside Aztec Student Union, the sparks are flying. A crew member cuts framing (April 2013). Crew members are using powder-actuated tools to cut metal frames down to size. From the rooftop to the basement, walls are coming together. 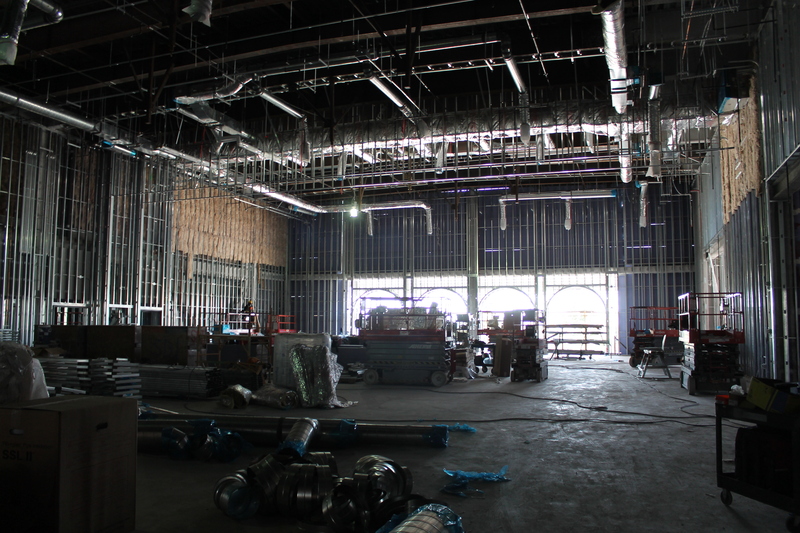 Framing is close to completion in Aztec Lanes, the bowling alley in Aztec Student Union (March 2013). Montezuma Hall framing is close to completion (April 2013). 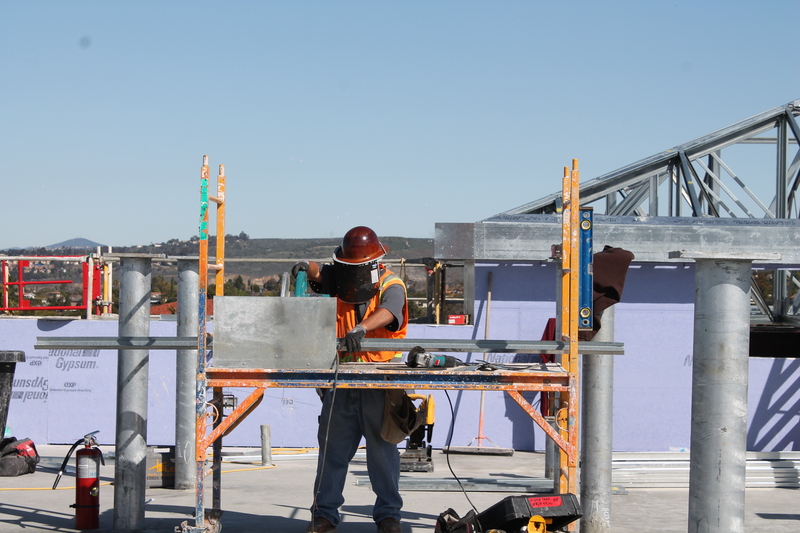 A crew member cuts a frame to size while working on the roof of Aztec Student Union (February 2013). The smell of burnt metal is fairly strong, so you may have noticed it if you stand in a stiff breeze while walking past the building. While it may smell awful, there are no known health dangers related to the use of powder-actuated tools. Do you have a question about Aztec Student Union? Ask it today by commenting here, on Facebook or via Twitter! Visit the Aztec Student Union website for more information on the project or to watch the live construction camera. 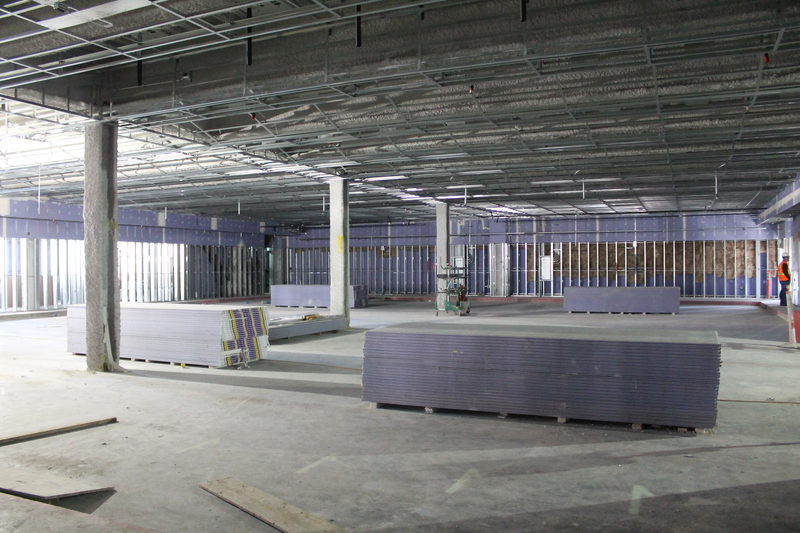 People who are not regularly on campus might like some photos of the project from a distance – just to get some idea of the real scale of this building. Walking around campus, I am sometimes amazed at another view of this huge project and how it dominates the campus “skyline”. Thanks for your comment, Dr. Snavely! I’ll make sure that we start including some shots of the building from afar. I also recommend folks check out the live construction camera on the Aztec Student Union website.